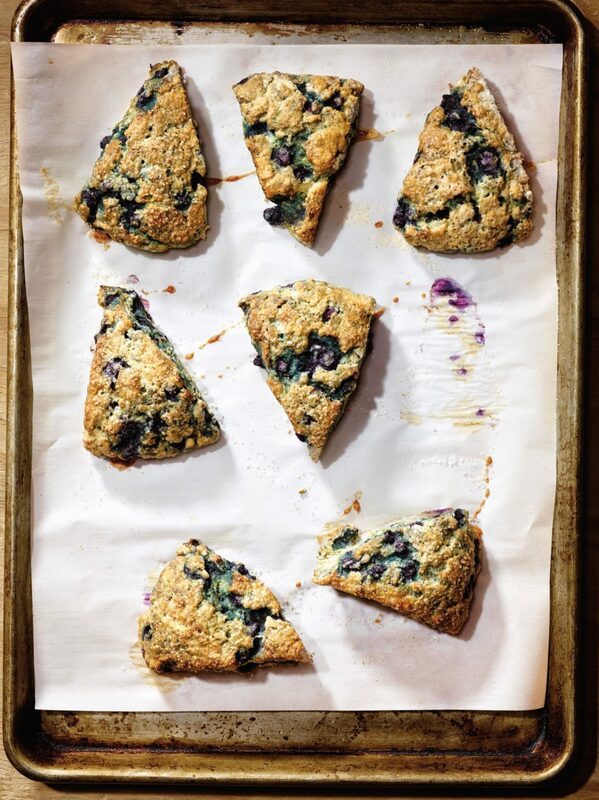 We love this gluten-free scone recipe by our friend, San Francisco food stylist and allergen-friendly recipe developer Jeffrey Larsen. With a vegan variation that creates equally delicious results, everyone can enjoy wonderful scones! Think of this as a foundation recipe. You can easily make basic scones by swapping the berries for 1⁄2 cup of currants or raisins or get fancy by adding cinnamon-pecan praline flavors. But if you do include berries (which we highly recommend, because man are they good! ), go with frozen ones; unlike fresh berries, they don’t fall apart during preparation. No matter what, use full-fat sour cream; fat-free versions have thick- ening agents that will affect texture. Also, should you want to make extra for later (another good idea), freeze them uncooked in an airtight container or bag, then bake them straight from the freezer, no defrost or extra cooking time needed! Want to go vegan? Swap the butter for an equal amount of vegan butter and replace the egg and sour cream with 1/4 cup of your favorite alternative milk and 1/2 cup unsweetened applesauce, mixed together with the vanilla extract. Position the oven rack in the center of the oven. Preheat the oven to 375°F. Line a baking sheet with parchment paper and set aside. In a medium mixing bowl, mix together the sorghum flour, tapioca starch, potato starch, brown sugar, baking powder, baking soda, xanthan gum, salt, and citrus zest. With a pastry cutter or fork, cut butter into flour mixture until the mixture is crumbly and resembles a coarse meal, then add the berries. In a small bowl, beat 1 egg until very light and foamy. Add the sour cream and vanilla, then add the mixture to the dry ingredients and mix with a big spoon until all the ingredients come together. The dough will be soft and somewhat sticky, but should not be wet. Transfer the dough to a countertop dusted with 1 tablespoon of sorghum flour. Dust the top of the dough with a little sorghum flour, push the dough together until all dry ingredients are incorporated, then shape it into a large round 3⁄4-inch thick and 7–8 inches in diameter. Don’t play with the dough too much; the warmth of your hands will melt the butter. With a very sharp knife, cut the dough into 8 even triangles. Place the triangles 1 inch apart on the prepared baking sheet. In a small bowl, beat 1 egg, beat in 1 tablespoon of water, then brush scones with the egg wash. Sprinkle each scone with the coarse sugar and bake for 20 minutes, or until slightly golden brown and cooked through.